Smooth and bold, featuring a 1.6 mm ball point for extra-smooth and extra-bold writing. Features exclusive ink-system technology for smoother writing and a more vivid line. Translucent barrel offers easy and convenient ink-supply viewing. 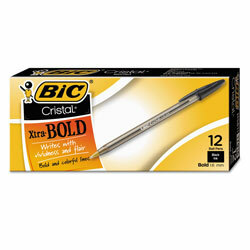 Point Size: 1.6 mm; Point Type: Bold; Ink Color(s): Black; Pen Type: Ballpoint. INNER PACKAGING: 12 per pack. Black Ballpoint Stick Pens from Bic! 1976 In Stock today.